That's what I feel my days are doing - no - the weeks, months and years! Absolutely unbelievable how we move from Monday to Saturday and on and on. The big consolation is that I can see that accomplishments have been made during that period of time so that helps! LOL. I just returned from teaching at Blue Bonnet Retreat at Horseshoe Bay Resort outside Austin, TX. It is always so nice to be able to share our passion with others of like minds! This was our first time at this resort and the facilities were beautiful. The food was absolutely excellent! The only shortcoming I witnessed was the slowness of staff - but it is the off season and they likely have not dealt with a group like ours - LOL. Next year will be even more fabulous. I am home for a few days before I head back to Texas - this time Houston. 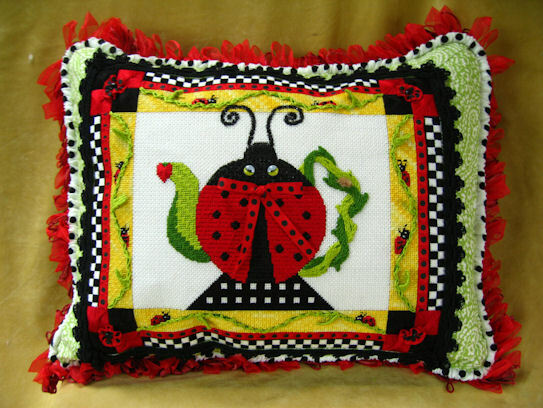 I will be attending a Stitch Away at LaToretta Resort as a member of the Lone Star Chapter. Always a great time. I even manage to get a little stitching in too! Classes are moving right along. 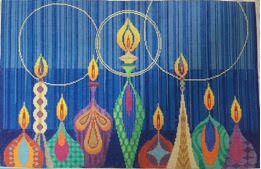 We will be introducing our first lesson in the beautiful Menorah in the Online Mystery agenda mid-March - just around the corner! Invoices are being processed in preparation for the first posting mid-March! Everyone who contacted me for thread/embellishment kits should have been acknowledged. Shipping is expected on or about March 7. Steampunk Fox will have his Second Session posted in a few weeks as well. Next will be the Third Session for the Large Easter Rabbit and the Fifth Session for the Santa's Reward design. And, as we must do with all classes, we will be saying goodbye to the Pillow Collage year-long class. What a fantastic journey we have had. Such sharing across the world! New adventures are cropping up as well. The reception to our new Quickies has been fabulous. 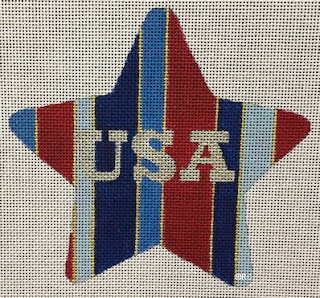 Our first design to be spotlighted is Raymond Crawford's USA Star. This class series is meant to turn around quickly - Quickies - get it? 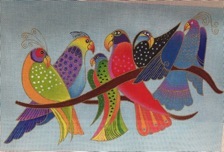 They will be all inclusive - lessons, painted canvas, threads and embellishments if appropriate to assist in having all the necessary supplies quickly. The lessons will be covered in two postings one each month for a two-month period. The Quickies will be small and portable. The first Quickie class is the USA Star and the all inclusive kit is very reasonable. Send email to me at duodesignsinc@yahoo.com to get all the details if interested and to be included in the fun. We have also added another unique class that we refer to as 'No Schedule - No Stress - No Deadlines.' 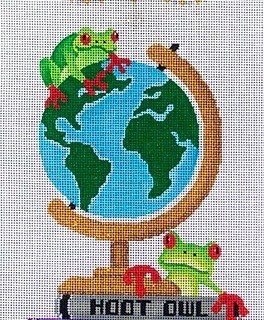 The first class in this category is by JP Needlepoint Designs and looks to be lots of fun. 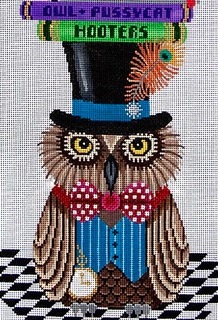 Nutty Professor Hooter is a tall and slim - approximately 8" x 33". The concept of this class is that a lesson will be posted as I get to it - maybe in a week - a month - two months - no schedule just whenever. For more details regarding supplies and costs just email me at duodesignsinc@yahoo.com. Look at those red toes! OMG! This is going to be too wild and cool! 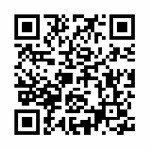 Email me at duodesignsinc@yahoo.com if you would like to be on the notification list! So I must now get back to getting the upcoming lessons stitched so I can go back to Texas to play! Hopefully I'll remember to take the time to visit online next week! In the meanwhile remember to Stitch with a Smile! Last week I shared some new concepts I am introducing and you responded strongly! Thank you for your acceptance. So we will keep you posted on the progress as soon as we start receiving canvases for the 'Quickies' and the 'as we get to it' projects. First on the agenda will be the elegantly simple Raymond Crawford USA Star. As soon as the canvases are received we will be able to start shipping to those who have entered the class. As we stated earlier, these 'Quickies' will be all inclusive: canvas, threads, embellishments (if applicable), S/H and 2 lessons posted one a month in the secret Facebook page. No matter how many techniques are covered they will be shared in 2 postings. The USA Star is slated to begin early summer. Be sure to get enrolled right away if you want to be included in the first wave of students. Later this week we will be sharing more lessons for the current Online Mystery Classes. If my students enjoy these classes half as much as I do we are all having a grand time! There is always something new and a surprise around the corner. Some good surprises - every now and then a not so good surprise. There are times that no matter how hard you try you cannot get something to turn out the way you imagined. But, the good part of that experience is that you usually come up with something better. 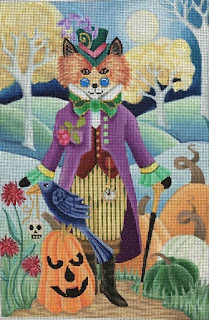 We squeezed in an extra class for the February calendar and it is the first in our Steampunk series from Brenda Stofft. The Steampunk Fox is so dapper and will offer us many challenges! He is a happy and colorful piece and those are the kind that I like to work with. Everyone who has requested information has been notified of their kits. The next regularly scheduled new Online Mystery Class that will begin in mid-March is the fantastic Menorah from Tapestry Fair. This piece has been long awaited by many. Blue happens to be one of my favorite colors so I am already ahead on this one! There will be lots of sparkle going on here. The thread list and embellishment list has been posted in the secret Facebook page for those that have paid to participate in the class. Email me at duodesignsinc@yahoo.com if you have any questions about this upcoming class and if you need assistance with the kit options. Next up will be the wonderful Songbirds from Danji that will be flying in. The background has been stitched on the model and threads are being pulled. The mind is going spastic here! Love it! Let us know if you would like to join us for this adventure. This will have a first lesson mid-May. 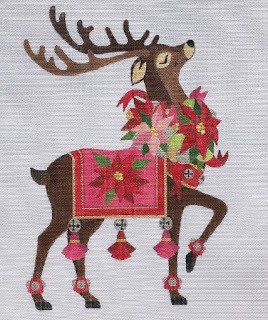 Deposits being taken to hold canvas and thread/embellishment kits for this class - email at duodesignsinc@yahoo.com. Shortly thereafter, the fun, fun, fun Cupcakes from BB Needlepoint Designs is on the calendar. My daughter and I have had so much fun coming up with things to share with you on this one. This design was repainted specifically for us and we have our own canvas number because we asked that the designer make it a little larger so we would have lot s of room to showcase some fun techniques. You are gonna love this adventure! Specialty threads, beads, quirky applications - who knows what we will come up with? The embellishments on this one will blow you away. 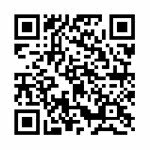 Come join us for the journey. 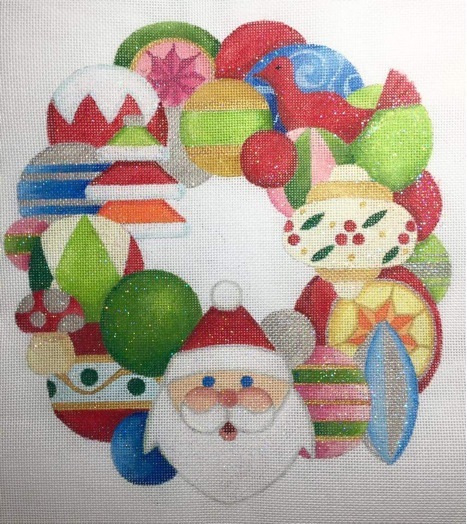 Last week we highlighted the cute Raymond Crawford Santa Ornament Wreath and stitching is underway for the model! I believe there are 24 ornaments plus the Santa one. We have had a lot of fun planning this one and the stitching fingers are itching. me at duodesignsinc@yahoo.com. Don't miss out on the fun! I received the good news that I have been selected to teach at the American Needlepoint Guild Seminar 2018 that will be held in DC. They have included an Encore class that I taught at the ANG Seminar 2017 in New Orleans - Can Do Hairdos. This is a fun techniques class and we do a lot of giggling while executing the various techniques. Another class they have selected is a time where we will work with the students assisting with individual issues as they arise. Stitching Solutions will be presented as two different one-day classes. We will be sharing ideas with those who are seeking assistance with their project whether it is one where they are stuck and have just hit a brick wall or whether it is a new project and they just don't know where to start. The two one day sessions are offered to provide the opportunity for more people that may be interested in playing. But before all that guess what occurs? I leave Friday to teach at the Blue Bonnet Annual Retreat! How much fun is that? 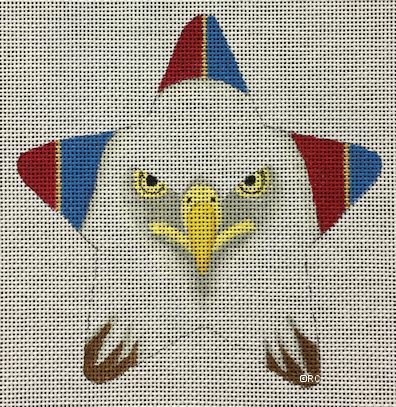 I will be teaching two of JP Needlepoint Owls - always fun - and sharing techniques with my students. But also I will get to visit with friends that I only get to see in these type venues. I am looking forward to it. So until next time from Texas! 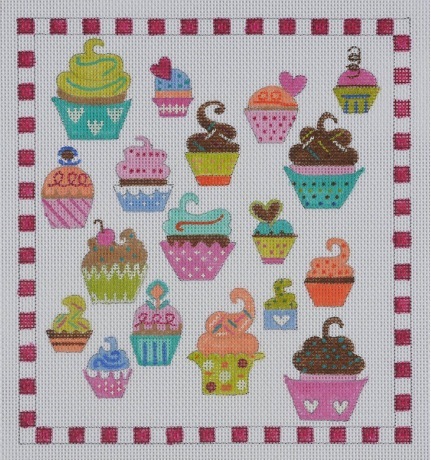 have a great week and remember to stitch with a smile. We all have too much to do right? We never have enough time right? (Someone once told me many years ago that God gave us 24 hours in a day - that's it - it is how we choose to use it that matters.) And I assume that most of you reading this share my passion for needlework. Well, unfortunately, there are just too, too, too many wonderful designs out there to play with. And also, unfortunately, I want to play with them all! I find things that appeal to me and I think I'm all set and then you guys come up with some more and do the 'please, please, please' bit and I can't turn you down. So I am trying some new approaches this year to see if we can get more in and still have a ball doing it. 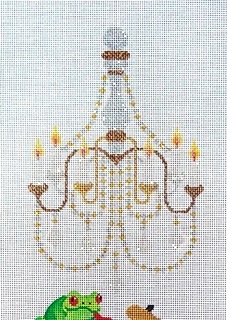 Then I have added another 'do as we can' class the Nutty Professor Hooter by Juli of JP Needlepoint. 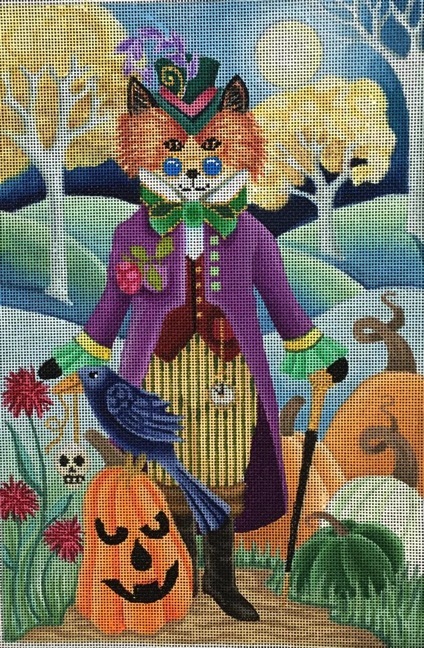 I could not pass up this guy because of all the techniques we can use here - beads, ribbons, combination stitches, padding, who knows. Anyway he looks like way too much fun. He is 8" wide (not bad - very manageable) and 34" long. For details about the canvas, class starting time, etc., just email me at duodesignsinc@yahoo.com. Anxious to get my hands on this guy. Next in my new stuff is what I call 'Quickies". These are smaller pieces, less expensive, fully kitted, and will be two lessons. Since there has been so much hoopla this year because of the election, and since I am from a flag-waving family (Dad fought during World War II, Brother served, Husband was a Marine during Korean Conflict, etc.) I just could not pass up Raymond Crawford's patriotic stars to start this new experiment. The first will be the USA Star to get you warmed up. Hope to be able to get this one going September 2017. 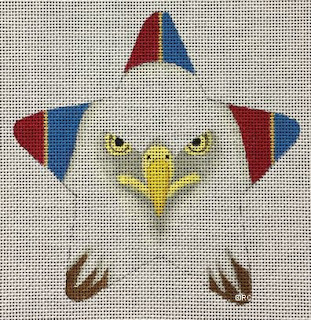 Then, we will move on to the American Eagle Star - WOW. Quick Glimpse: These QUICKIES will involve full kitted projects. They will cover a period of 2 months - one lesson a month and you will get 2 lessons that will be for the whole project. So, whoever is interested just send me an email to duodesignsinc@yahoo.com for more information. Please email me with your thoughts, requests, suggestions, etc. as to how this would be more beneficial to you. I would love your feedback. I have had such a wonderful couple weeks being at home and stitching, stitching, stitching! What a joy. And what fantastic results. I am loving it. The Lessons in the Online Mystery Classes that are scheduled to be posted in a couple weeks are the last lesson in the fabulous Robin's Wreath. It is always sad to say goodbye. We'll share a picture of that fabulous piece when the lesson goes out. Then we are doing the second session for the Large Easter Rabbit. Hmmm. Getting more background out of the way on this one and then we will be ready to really play with lots of fun stuff. The 4th session of the Santa's Reward will also be shared. This piece amazes me more and more. I am thrilled beyond words at the results that are coming forth. You imagine things one way and it is always so wonderful when those things are achieved and go beyond expectations. That is what is happening on this piece for me. And lastly will be the first session of the first in the Steampunk series by Brenda Stofft - the Steampunk Fox. Notices have been to sent to all who ordered thread/embellishment kits and we are getting geared up for fun on this guy. The Menorah is quickly moving up the chart and will have its first lesson in March. Wow. Such beautiful threads. We are able to incorporate some of the newer ones introduced at market this past month too. Those who have indicated an interest in this class watch for email with details concerning invoicing and various kit options. I spent a great deal of time yesterday selecting stitches for the Santa Ornament Wreath by Raymond Crawford. Threads are being pulled and finalized for the stitch guide and kit preparation. Well back to work - have a great weekend!